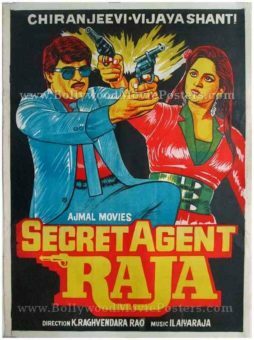 Rare old Chiranjeevi movie poster of the 1991 Bollywood film, Secret Agent Raja for sale. This is an actual surviving old Bollywood poster of the 1991 classic, which starred south superstar Chiranjeevi in the lead role opposite actress Vijayashanti. Vijayashanti is often tagged as the “Lady superstar” of South Indian cinema. 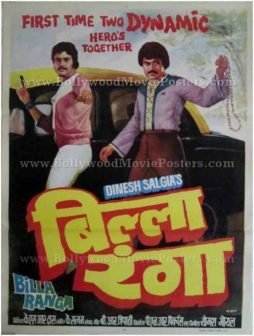 The combination of two superstars on this hand drawn Bollywood poster make it highly collectible! Printed and circulated somewhere in the 1990s, this old Chiranjeevi movie poster was originally designed for publicity of the film in Kolkata but never ended up being used. This hand painted Chiranjeevi movie poster features a kitschy hand drawn portrait of Chiranjeevi holding a pistol. Actress Vijayashanti appears alongside in an almost mirror image in this hand drawn Chiranjeevi movie poster.